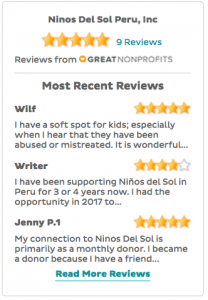 Niños Del Sol has earned the Platinum Seal of Transparency from GuideStar. This is the highest level of recognition from the world’s largest source of nonprofit information. We’ve been working very hard to make sure your donations are treated with the utmost respect and care. 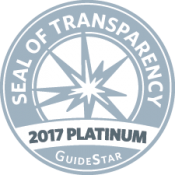 We’re doing it for you, but we’re very proud to have this recognition of our work from Guidestar. To reach the Platinum level, we added extensive information to our Nonprofit Profile: basic contact and organizational information; in-depth financial information; quantitative information about goals, strategies, and progress toward our mission. To learn more about GuideStar Platinum, visit guidestar.org/platinum.